Close to 400 journalists from 31 countries will gather in Yangon, Myanmar March 10-12 to discuss “Challenges of a Free Press” in Asia, the Pacific and the U.S. The conference proceedings will be covered online at a special website,EastWestCenter.org/IMC 2014. Visit the site to see news reports and video of keynote addresses, session summaries, social media coverage, and more. Twitter users can follow the conference – and join in the conversation – through the hashtag #EastWestMedia. 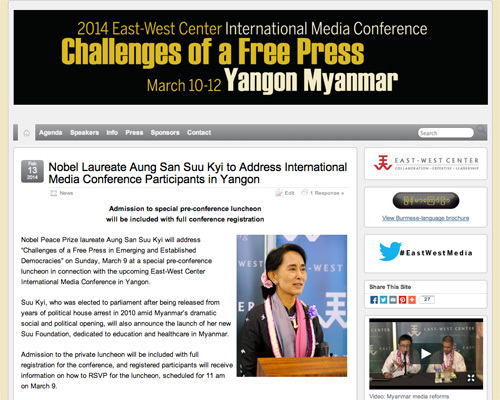 Coverage will also include a special pre-conference address on March 9 by Nobel laureate Aung San Suu Kyi. Newly added speakers include Nay Phone Latt, a Myanmar blogger and political dissident imprisoned for his writing and winner of the 2010 PEN/Barbara Goldsmith Freedom to Write Award. New programs include Regulating Hate Speech: How Not To Do It. Ethno-Religious Strife in Southeast Asia: Media Part of the Problem or Solution?